A historian’s paradise, a tour to Khajuraho is one of the best ways of knowing more about the rich culture and heritage of India. Known for its exquisitely carved temples, Khajuraho is in every sense of the term, a historian’s paradise. Though, a tiny village, if bereft of her temples, much of the complex of Khajuraho offers an insight into the intricacies of ancient Indian civilization. 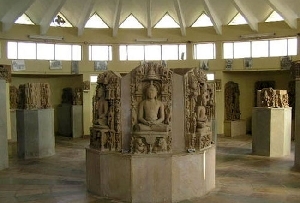 Helping us to rediscover the rich past of India are the various Museums in Khajuraho in Madhya Pradesh in India. The main museum of the ancient city of Khajuraho is the Archeological Museum which was built by W.A. Jardine around the year 1910. Built near the Matangeshwar Temple around the western group of temples in Khajuraho, the Archaeological Museum in Khajuraho also possesses an open air museum which houses some of the masterpieces of Indian architecture. Though, today used as a reserve room, the open air museum prohibits public entry to a large extent, the rest of the attractions of the Archaeological Museum in Khajuraho never fail to attract the tourists to the region.